Good morning (and afternoon for you East Coasters)! Hope Tuesday is treating you well! 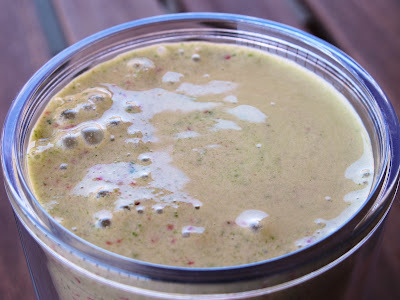 I have a delicious smoothie to share with you - one that is perfect for breakfasts or afternoon snacks. I've dubbed this the Christmas Smoothie. Now the Stanford logo may have something to do with it, but this smoothie reminds me of my favorite holiday. 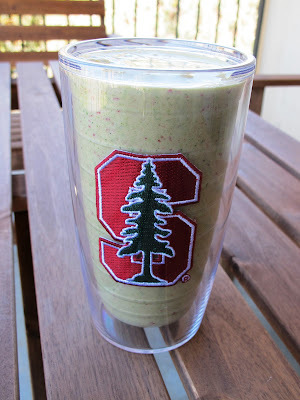 Oh, and for those of you who are new to adding spinach to smoothies, here's a tip: try blending the spinach with your main liquid first before adding the remaining ingredients. It helps to break down those leafy greens! Does the weather affect your food cravings? While I wouldn't want to eat a Thanksgiving dinner during a hot July day, for the most part weather doesn't have an affect. I still eat oatmeal in the summer and even smoothies in the winter! And ice cream? That's a year-round treat, my friends!